Doodlecraft: How to Cover a Text Book: Back to School with Tombow! How to Cover a Text Book: Back to School with Tombow! I received some awesome supplies from Tombow, contains affiliate links. All opinions, craft ideas and silliness are my own. I remember the good old days of school...and having to cover my text books with paper. #2. It gives you something to doodle on. My teachers always commented on how much I doodled...hence my nickname doodles--and the whole doodlecraft thing. Okay, let's cover these books! I don't have text books, but I have these great character encyclopedias! Fold down the top edge of the paper all the way across. Try to "center" how much of a fold you'll need with the top and the bottom. Doesn't have to be perfect though. Then fold up the bottom edge. You want the cover to be 1/4 inch taller than the actual book. Then the sides need to fold in. Guess about half the excess distance for each side. Fold in and crease tight. Slip the cover of the book right into that pocket you just made. Then close the book and you'll have the remaining flap left. Gently score it while the book is closed. Then flip it open and fold and crease the last flap. Now it's ready to fit that last cover in the sleeve. Works best if you stand it up and open it up more than it should. Then work the book cover into the paper sleeve you made. Close it up. It should fit to perfection! Now you'll need your adhesive dots. You'll just need 4 dots. Just stick them between the sleeve flap and outside cover of the paper. This will just keep it tight and from shifting. These adhesive dots are awesome. Now it's ready for doodling--or labeling! I used Primary Dual Brush Pens from Tombow. I just wrote the name of the book on the cover in a cursive hand-lettered script. Then used the dark blue in the center of the word...followed by a little black. Then I used the clear blender pen and just wrote over the layers a couple times to get the layers to merge together. Then a silver gel pen for some stars. I love the simple galactic look. Now these text books are ready to go back to school! Ready for doodles of all kinds! The small end of the Dual Brush Markers is perfect for simple doodles! This is a great way to protect books! This works for novels and all sizes of book too! Cover each text book in a different color paper for color coded class work! Like, Save, Share, Follow, Comment, or Pin for Later! 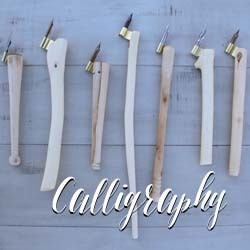 Check out these calligraphy and hand-lettering posts for more inspiration! Lovely lettering! I used to enjoy making fake titles for my textbooks (like "How to Build a Swamp" and other silly things).